What’s a single mother to do when she’s run out of options? Note: This book was originally published in 2000 by Harlequin Enterprises Limited. This book was originally published in 2000 by Harlequin Enterprises. 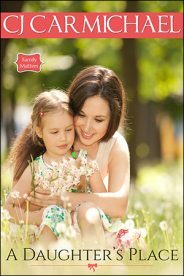 This new edition has been packaged with a beautiful, fresh new cover and is book one of "Family Matters" - a series which highlights several of my reader's favorite stories about women, children and the men who love them. "Why do I keep telling you my darkest secrets?" Gibson asked. Libby considered. "I guess because we feel comfortable around each other." "Oh, we do, do we?" His gaze was probing. "Is it just me, or am I the only one who's been doing the confiding in this relationship?" She stared resolutely at the ground. "I've told you what I could." He expelled his breath like a man who'd been hoping for more. "You're a hard woman, Libby Bateson. But I guess you've had to be." Libby felt a shiver travel down her back at the accuracy of that last statement. It was almost as if he knew. But of course he didn't. She'd told him she had money problems, but he couldn't realize that their situation--hers and her daughter's--had been close to desperate for most of the eight years she'd been away. He had no idea of the hardships she'd faced, yet he spoke as though he did.